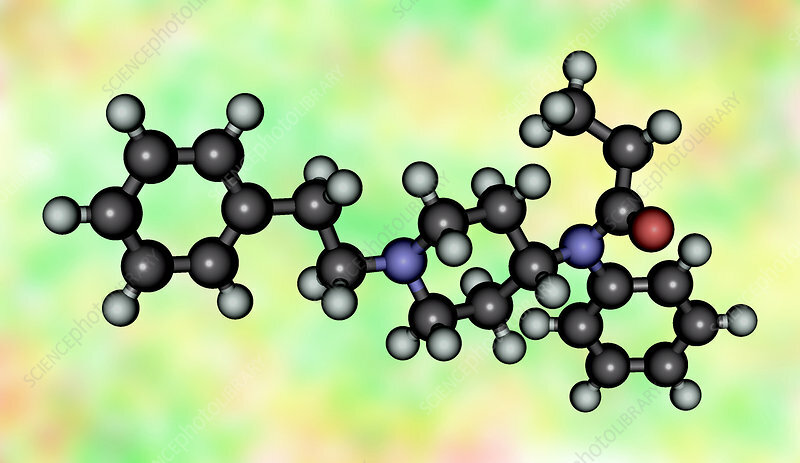 Molecular model of Fentanyl (also known as fentanil, brand names Sublimaze, Actiq, Durogesic, Duragesic, Fentora, Matrifen, Haldid, Onsolis, Instanyl, Abstral, Lazanda), a potent, synthetic opioid analgesic with a rapid onset and short duration of action. It is approximately 80 to 100 times more potent than morphine and roughly 40 to 50 times more potent than pharmaceutical grade (100% pure) heroin. Its abuse may lead to death. Chemical formula: C22H28N2O, molar mass: 336.471 g/mol. In the model shown, carbon atoms are black, oxygen is red, nitrogen is blue and hydrogen is grey.